Thats how all reviews should be. It would force developers to work on the single player aspect and not just have it tacked on. It would be like for Ratchet and Clank getting lower marks because of no multiplayer. But Uncharted 2 seems to be perfect in both single player and multiplayer. Every major review site/magazine has been giving this game 9.5 and 10's. Even 21/20 ! I could've spent 1500$ on a launch PS3 and even if it would take 10 years... if i got a game like Uncharted 2, it would be worth all the time and money. every PSM (insert location) has given this game a 10 or higher. It's important to note though they don't overrate PS games based on their previous track record. I wonder if there'll be as much of a leap in Uncharted 3 in the graphics department. It will be difficult achieve the same impact to say the least. And following off of 1.1. If that were the case Gears of War 2 would have been sent to the gallows. Games should be rated on quality "not quantity" of work and without bias (even though I know that's not possible). Uncharted 2 appears (appears because I myself can only go by videos and first hand reports since I have yet to play it) to be one of the finest games, not only for this generation but arguably ever, the gaming world has even seen. The online beta was a blast and I loved the original single player experience. I can't wait for the full version. My only problem is what to play first (story/campaign, co-op or multiplayer). you cant expect all games to have multiplayer. Heavy Rain, no multiplayer = 10/20? as much as i feel this game deserves a score like that you not doing the math very good. 10/10 + 10/10= 20/10, now to get the average you must devide by 2 so 10/10 again. to kirby 3000, i can see your point, but they wouldnt review a singleplayer only game 2 times and give the multiplayer a 0 then procede to deduct that from the overall score. i personally think this idea of single and multi reviewed seperately is a great idea, some people only want single player, some could care less and only want multi(for all games in general not just UC2) so having them seperate means the people who only want one can read the only parts that are relevant. It's not retarded. If you give an amount of time post release to award a score to a MP element of a game then you hive THAT game a fairer chance as an overall package against great SP games like Uncharted or Bioshock. That's becuase many games launch with MP problems. Also if games were all reviewed like this EVERY game with a SP would have to make sure it's up to standard wouldn't they? Besides, most games mp isn't that great pre release as you are only playing against other journos and people from the dev team/ a few beta testers in general and you don't see these guys finding glitches and trying to ruin the game like you do with the general public. It's just a fact that most pre release mp reviews are pointless and only give a vague impression of what you'll find with the whole world online! I'm not saying U2 should get 20/10 of course but I think it's fairer this way as every MP is in the same boat and every SP too-is it QD's fault that HR isn't suitable for MP, or Team Ico's that TLG won't be either-because I've seen games lose points before for not having mp and also for trying to avoid this and then tacking it on! IMO reviewing both seperately, while it buggers up Meta a bit is still fairer and forces eberyone making either element to only bother if they can make them equally brilliant. It would encourage excellence all round, imo, and would you rather a mediocre SP with a tacked on MP just because of feature creep, fashion and because devs are scared into trying to do eberyting when they don't have the resources? Surely in these cases it's best to concentrate on one great mode, no? Well seperate sp and mp reviews would encourage this thinking. So while I see your point I, personally, think it would, done right, be a better way for enduring fair reviews and devs to concentrate on what they do best with their limited funds and time. Please dethrone Grand Theft Auto 4. It doesn't deserve to be known as the highest rated game of this generation. I'd rather U2: AT receive that recognition. Not that I care THAT much about reviews, but seeing all these 10's gets me super giddy knowing that such a game CAN exist. Yay, real scans! Those are rare nowadays. that 8 from gamereactor looks more like bs with each review that comes out but i guess it served its purpose of bringing attention to the site. if Uncharted 2 worth 8/10, how could other games get better scores? 10/10 doesnt mean perfect, it means Awesome-Must Buy-GOTY- and Incredible. 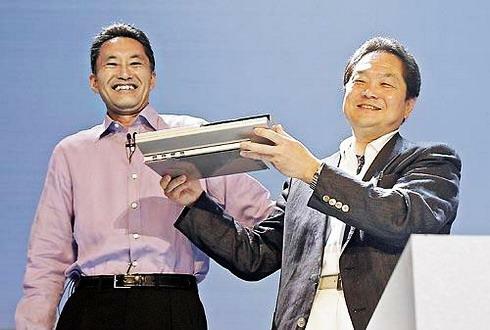 Not just Sony Sir Ken but Naughty Dog + THE PS3!!!!!!!!!!!!!!! ONLY POSSIBLE ON THE PS3 ;-D!!!!!! This game is gonna be so badass when I get my hands on it. Uncharted 2: Only on Playstation. I disagree. This is over 9000 A! @Obama: you mean http://www.youtube.com/watc... ? Vegita! What was the score of Uncharted2? It's over NINE THOUSANDDDDD! I was in the first beta and now in the 2nd and just cant get enough of MP. Two AAA games on the PS3 in a couple of weeks apart. That's exactly what I said. One week with Demon's souls and then I don't know when I'll be seeing it again. After UC2 releases I will play to finish it; Then I will put in some multiplayer time. Maybe Christmas? But at least these will be my last games for the year, as I will not be buying anything else; Except maybe PS1 classics ,and if good PSN titles release. Maybe I can finally buy Siren! Been waiting on a Bluray release, but alas! Edit: Ahhhh! Just went back to the front page and saw GoW collection, forgot about that! I guess I will give PS2 GoW 1 & 2 away to somebody and get the collection with demo! Dammit I'm so sick of reviews that tell you everything you're going to be doing in the game. I had to stop reading after realising I'd just skimmed three pages of 'and then you'll be..' 'which leaves Nate hanging ...'. Good score though. lets be honest for one second and step outside the box..its a OPM, of course you will get a good score...lets wait for the other big sites which matters to the metacritc: 1up, gamespot, edge, gamedaily, etc...im sure it will continue to get good scores, but this one is a given.. I don't agree at all. Platform specific mags might have a bdad name for this but, imo, the UK OPM has been very fair. They didn't give KZ2 a ten when lots were and is always pretty much on the money for me scores wise. OXM hasn't been that bad in the other direction either of late-remember their job, while to cater for one platform, is still to tell gamers what they really think and to just lie would soon leave them massively criticised and out of a job. OPM UK is often a little vritical of Sony in any case so I trust their reviews as much as anyone's. KZ2 would have been the one you'd have thought any bias would out but Bioshocks weakish PS3 port got the same marks and MW got a 10! They don't hand out tens just cos it's an exclusive. CS only got 8/10-I was amazed as I thought it was a 9 all day long. who cares if its a playstation magazine if anything its a better place for reviews of ps3 exclusives because they won't take points away from the game just because it doesn't play like an xbox game. basically if i want someones opinion on a game i want them to actually likes or at least gives it a chance before judging the system look at the gamereactor review of UC2 they gave it a low score for replay value not because it had no replay value but because they preferred halo and gears . also just because it is a playstation magazine doesn't mean sony is giving out the scores so its not like there paid to make playstation games look good so it is fair an unbiased not everyone are fanboys they just prefer the ps3. Great review. It was nice that they had some scans to read. PS3 it only does AAAA exclusives! You, and ten thousand others have called it. It's a well deserved GOTY. Reviewing multiplayer seperately is stupid... I pay $60 for the game and I want to know the value I'll get for that $60 even if I spend all my time on single or multiplayer. Sorry, but until this site/network refuses to respect IP/copyright issues insofar as they extend to print or whole-copy site property, I'll refuse to read these pieces. Don't link to scans, and clamp down on "I'll post this in entirety to deny their traffic" links. Otherwise N$G will re-enforce a most unwelcome perception amongst the online gaming community.